This is not as close as it looks on his angular map. The Red and Blue (on this map) end at Mall of America. To "extend" to Southwest Station is 12 miles!!! I know, but the extension would serve the American Blvd./I-494 Corridor which has a lot of jobs along it including the Best Buy HQ and Normandale Lake District. Sure, but that's likely a whole new line not just an extension. mamundsen wrote: Sure, but that's likely a whole new line not just an extension. Whole new line? Yes. Extension of an existing service? Yes. See SWLRT and Bottineau. I have to say it looks teal to me (halfway between blue and green, get it?) but I am pretty colorblind so I'll take another look. Regardless after six lines or so I think most rapid transit systems need to switch from color designations to letters/numbers (as LA is doing). @thatchio you're right on about the cost of tunnels and a slightly more realistic proposal would probably have a single downtown N/S tunnel. 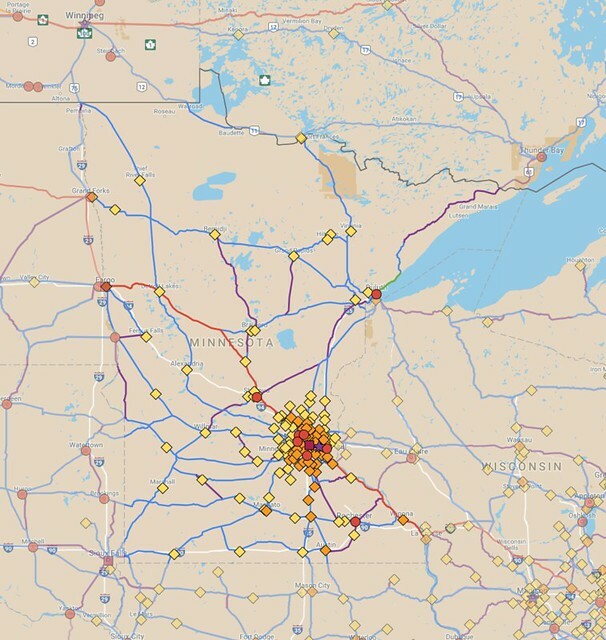 The issue is that it may be hard to get good service frequencies to two northern branches — plus I'd really like to see a Hennepin subway, though I imagine it would be a relatively low-priority add to the system with the first tunnel in place. idreyn wrote: The Twin Cities express, appearing as part of Green on the map, is an express service between the downtowns and would be realized as either I-94 median rail or some kind of crazy beefing up of the Central corridor (think underpasses, CBTC, and more crossovers) that would permit an express service on two tracks. This is easily the craziest proposal here but I think a frequent way to connect the two downtowns at a speed faster than car travel on I-94 is actually pretty necessary to make taking transit clear across the metro appealing and feasible, and to really knit together economic opportunities across our sprawling Cities. I've been kicking around the idea of an express LRT service between the two downtowns in my head well for a while and there are some large challenges for sure but I think you are largely on the right track. Running down the middle of 94, to me, seems like the most efficient and effective way to get move between the downtowns. Assuming Riverview gets built using those tracks from Union Station to the X from there it would make the most sense then veering off and running down the middle of 94 stoping at Snelling and having some sort of vertical transportation to provide access to the A-Line. From there it would need to access the U somehow and I'm still not sure what the best way to do that is (maybe using the existing railroad bridge combined with streetcar?) It could continue down the middle of 94 and meet with existing Blue Line tracks by Cedar Riverside and follow the tracks Target Field. I know some of you guys had seen it and commented on it, but I figured I'd post it here too. I've had to make a bunch of maps in the process. The image is stitched together from several maps that I've been working on: Minnesota, Michigan, Wisconsin, Iowa, Nebraska, South Dakota, North Dakota, Manitoba, and Ontario. While many of those are mostly complete, they're all still works in progress to varying extents. I also have maps for Alaska, British Columbia (& Yukon), Alberta, Saskatchewan, Quebec, Montana, Wyoming, and Illinois. We'll see how much farther I manage to get. That's already a sizeable chunk of the continent, so I'll try to keep going on that, but it'd probably be a year or two to finish (if I don't just give up on it before then). I'm going to try a similar thing with some other countries too for comparison purposes (I'll probably just map existing rail and not worry about trying to add new lines to them). I've started on a Norway map, for example, just since they have a similar population to Minnesota (5.2 million vs. Minnesota's 5.5 million). Norway's actually less dense overall than Minnesota by a pretty wide margin (35 pp/sq.mi. vs. MN's 67 pp/sq.mi. ), though obviously its cities are denser. They manage to have a ridership of 60 million annually on their intercity and commuter networks, compared to only about 800,000 or so for Amtrak + Northstar in Minnesota (they also have a bus network which carries even more people, over 100 million annually). Fwiw frequency on the various bus lines isn't necessarily what they are currently (ie route 80 would be more than a peak-time service). I would assume they would run at least every 30 minutes, and cover a fairly full span of the day, because service less than that wouldn't be very useful. Here's my crappy idea since I work and plan to live in Wayzata and might be nice to have the Wayzata depot back for passenger use. So I'd have a commuter line like Northstar go from Wayzata to Minneapolis to St Paul directly, maybe a stop at West End. Also could extend west to Long Lake or Maple Plaine and have a park n ride there and then east to Woodbury or something. Uses existing rail line and has few crossings. You could arguably add a stop at Hopkins Crossroad since it is a concentration of apartments and condos of modest density. How big is your assumption that Bush will be built into a street between Arcade and Forest? Land is owned by the Port Authority. No idea, though a small street connection there is easier and seems more likely than St Paul building all those streetcars. I like the idea of having the ability to provide transfers between any heavy rail service that may pass through in the future and our local transit system, thus the Bruce Vento and Oakdale transit centers. This would be part of the METRO system. Would also be part of the METRO system. Either ABRT, BRT (dedicated and/or mixed), or LRT (an extension of the Blue Line). For the limited-stop routes there would only be minor infrastructure upgrades (extended bus lanes, new on/off ramps, etc.). Frequency would likely be half an hour at most. Do small bike/ped bridge and trail connections count as maps? Essentially I want to see some sort of trail that would bridge the gap between Beltrami and Marcy-Holmes that's created by Hennepin. The trail could also be used in future connections between a NE diagonal greenway, a trail that leads to the Capitol along Energy Park and possibly the Midtown Greenway if extended East. Fillmore is already pretty bikeable, and 9th Ave made sense since it will run into 8th. The rail it would be replacing is mostly abandoned, but a small bridge would need to run parallel to the current rail bridge. I like it! That would be a nice addition especially in conjunction with a NE greenway. Wouldn't it make more sense just to connect up to 6th Ave SE, which is already a bike boulevard and extends to the Stone Arch? Of course it would. But I also wanted to make this realistic, and removing parts of a building for a bike trail is challenging. There are already supposed to be (unfunded) plans for a bridge over Hennepin connecting 6th to the Presidents bikeway. Not easy to imagine how anything here would get funding.